This is a story about the power of connection. When I first bought what is now Dancing TreePeople Farm, I imagined that I was going to create a fully sustainable life... all by myself. I would grow my own food, make my own energy, put in place a permaculture oasis and would create everything I need on the farm. Along the way, I learned that this is utter folly. I learned that it is impossible to create a sustainable life by myself. Yes, I could spend all my time and treasure to create a Shangrila --and end up broke and exhausted. In fact, I came close, all the way to putting a "for sale" sign out in front of the farm. Fortunately, friends convinced me that there was something we could do together... we could create a community and help each other. The most joy, the most abundance, and the most sustainable life increases with the number of beneficial connections. Relationships. People. Community. Today, we receive amazing organic vegetables from nearby farms by our farm mates helping others out. We receive seedlings from those who appreciate our eggs. We dream big creams and play-- we share what we have and receive. It is fun and beautiful. Our farm is stable financially and we are alive and loving life. 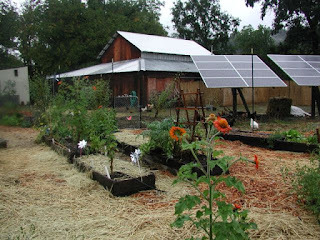 The permaculture principle: Stability through Beneficial Connections. It's simple. The most stable systems have the most beneficial and diverse connections. Stability is achieved through beneficial connections between diverse beings. Thus, diversity is related to stability. It is not, however, the number of diverse elements you can pack into a system, but rather the useful or beneficial relationships you can create between these elements. Stable systems are created through beneficial connections. This suggests that for those who worry about the stability of their household or local economy, or any other significant outer problem for that matter, time might be best spent creating and cultivating beneficial relationships. With these relationships, comes less volatility and greater stability.